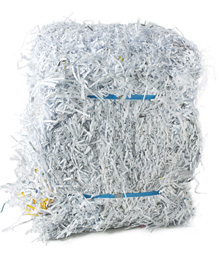 Paper Shredding is the most environmentally friendly method to deal with your confidential documents. Our paper shredders provide a high level of security due to the shred widths on our machines. Our two standard shredders cut to a shred width of 0.7cm. Our fine cut shredder cuts to a width of 0.4cm. Our particle cut shredder cuts to a width of 1cm. Once shredded all suitable paper is then recycled in the most appropriate way for that grade of paper. Our large industrial shredders will easily cut staples and paper clips so these do not need to be removed prior to our collection. There is no need to remove your paper from files or ringbinders. After paper is shredded on our site it is baled to reduce the amount of space required to store and transport the shredded paper. By getting us to shred your paper you remove the need to find a way of handling the expanded shredded paper. Our paper shredders are large high volume industrial models. So by using our service your staff do not need to waste their time standing around slowly shredding paper in your office, and creating large quantities of dusty waste that needs to be disposed of. 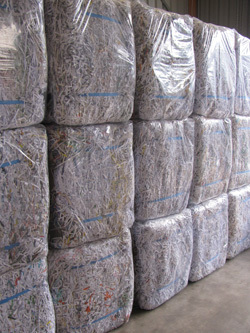 We are Auckland’s specialist Document Shredding Company.